Welcome to my first Rhodes Report! As I mentioned, my goal is to make sure you are getting the most out of the ServiceChannel platform along with our team’s industry knowledge to succeed in your role. Part of this is to share innovative approaches, new features and best practices I think you can benefit from as well as share with your management. Used daily by an ever-growing number of the leading Retail, Restaurant and C-Store brands, our ProView business intelligence reports have become the ‘go to’ tool to drive their businesses forward. Since ProView’s launch, our clients have run over 100,000 reports providing key insights about their operations. On a monthly basis, we’re seeing 80% of our clients regularly rely on ProView data. These reports have given FMs and their colleagues new levels of data to better understand and manage their repair & maintenance operations. But it’s not simply ‘more’ data; the beauty of ProView is that this data is now actionable and presented in a visually friendly way with the capability to drill into whatever depth you need to address your specific goals and challenges. Importantly, with this easy-to-use tool to analyze and report data, many of these companies have been able to drive real business savings. For example, in one case, a national restaurant chain had used a subjective process to manage their not-to-exceed (NTE) controls. The company sensed it was overpaying for some trades but with only a best guess approach, there was no way to know for sure. After analyzing their invoices with ProView, they could move to metric-driven NTE controls and cut costs dramatically. With newfound insight into average invoice cost per specific trade and repair type, it reduced its NTE amount each month. What kind of results did they see? 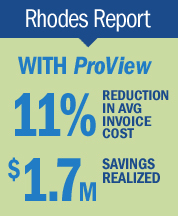 By tracking cost and implementing tighter and more accurate NTE controls with ProView, the chain reduced average invoice cost by 11% and saved over $1.7 million. ProView also provides a new way for Facilities Managers to get a better handle on the scores of contractors coming to work every day at all of your locations. Until recently, it’s been quite challenging to truly know which contractors are meeting the SLAs and performance standards you set and how they compare against each other, let alone in a consistent and quantitative way. Now, with our new Contractor Scorecard in ProView, you have a super easy way to measure and monitor your entire set of third party contractors; it’s already become one of the most popular dashboards. 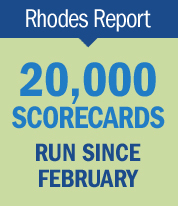 Since February, ServiceChannel clients have run over 20,000(!) scorecards to better understand exactly how their contractors are performing. Why? To start, the Scorecard’s accessible in a single click which loads a great-looking dashboard with lots of data in seconds. You instantly get a set of metrics standard across all contractors. 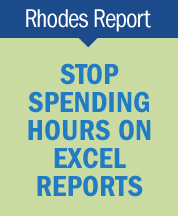 No longer do you or a colleague have to spend hours with Excel reports, manipulating them to put them in a useful format. The Contractor Scorecard provides a quick, easy and reliable way to measure and grade all contractors in the network on their performance as well as a 30,000 foot view on costs and trends. It’s already being used by hundreds of ServiceChannel clients and tens of thousands of contractors. In fact, this metric-based approach is fast becoming an industry standard. It’s proven quite helpful in not only working with contractors with an objective measure but also in delivering key data needed for discussions with management. I hope this gives you a better understanding of the increasing acceptance of ProView in the marketplace, and some of the ways in which you and your team could benefit directly. To give you a taste of what’s to come, our team’s hard at work on an online savings calculator. Our calculator will showcase your success by highlighting your R&M and cost savings as well as putting a hard dollar figure to them. I’d be pleased to work with you to make sure you’re benefitting from the same type of data insights and industry standards in your FM program. For some more background, there are two posts: one on how the facilities industry is leveraging data and another on the Contractor Scorecard, both recently written by Sid Shetty, who leads our consulting services and analytics group that I think you’ll find useful. Should you have any specific questions about using ProView, please contact your Account Executive. Next month ….the savings calculator.